alaTest has collected and analyzed 76 reviews of JVC GZ-MG155. The average rating for this product is 3.9/5, compared to an average rating of 4.0/5 for other Camcorders for all reviews. Views about the size and durability are on the whole positive. The price and usability also get good opinions. Comments are divided on the zoom. Many are less positive about the battery. We analyzed user and expert ratings, product age and more factors. Compared to other Camcorders the JVC GZ-MG155 is awarded an overall alaScore™ of 80/100 = Very good quality. alaTest has collected and analyzed 41 user reviews of JVC GZ-MG155 from Amazon.com. The average user rating for this product is 3.9/5, compared to an average user rating of 3.9/5 for other Camcorders on Amazon.com. Opinions about the size and durability are overall positive. The price and usability are also appreciated, but comments are divided on the zoom. 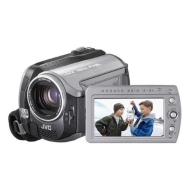 The JVC Everio GZ-MG155 is an excellent choice for users who want a versatile camcorder. The JVC Everio GZ-MG155 is an excellent choice for users who want a versatile camcorder that won't require them to burn DVDs constantly, and who want access to manual controls for more precise videography. This is a wonderful little cam for the home user. But if you want to do something more than just do quick home quality vids then spend some more money and get something better. If you want to do extended shots on the road get an extra battery. I wish there was an image stabilization setting, or a shutter speed setting or something, I'd be willing to pay extra for it. This camcorder has everything a beginner would want for filming and photo taking. The price was reasonable compared to other brands such as Sony or Panasonic and the major advantage is the hard disk recording.